So for 2018 we have lots of exciting new developments as we link up Sondela with our new race village at Elements. As per usual we have handpicked some of Sondela’s best and quickest single track sections which takes the route out of Sondela on the North-Western border and across the N1 freeway. Then we go past the Lion Camp, through the Humphreys farms adjacent to the tar road. On this section, we are working with a local village and building a road for them which they can use to go into Bella Bella. We spend 3km on this road before crossing the tar road and then climbing into the Waterberg. The first climb is not too serious on some single track before crossing the Modimole – Bella Bella Road on the plateau. The route stays on the plateau until it enters the very well-known ATKV resort of Klein Kariba. Some wonderful Klein Kariba hospitality waits at their water point before we tackle their beautifully sculpted single track trails. There are some technical sections inside Klein Kariba but it’s fun. We will go into the heart of the resort and experience a bit of their hospitality. Through Klein Kariba the event passes by the famous shop of Tannie Poppie Dinkelman. Then it’s onto Thaba Manzi where riders will spot some beautiful Rhino. We then enter a farm where we weren’t allowed to traverse last year – we’re busy building some wicked single track on the farm. Now we’re in a valley with some stunning cliff faces on both ends, passing by a few dams before entering Marulani. The event runs along the northern border of Marulani and climbs to the top of the plateau. The view from the top is amazing and the single-track reward on the other side just as stunning! The event then passes a natural spring (waterpoint) before entering the old SANDF grounds. We are building various single track sections on the former SANDF grounds You’ll be riding in a ravine and contouring the side of the mountain before entering an imposing orange farm and get the chance to enjoy some of Bela Bela’s famous citrus fruits. The route then runs past The Shack restaurant (waterpoint) where riders can hydrate in numerous different ways, including a cold beer. The route then enters the back of Elements. We will be riding some of the newly built single track in Elements and we’ve selected some of the nice rideable singles inside Elements. 2016 riders will remember Shakana for the cement climb we did. Shakana is also developing some interesting and exciting single track which will serve the race well in 2018. Once finished inside Shakama we enter back into Elements and speed along some more single track sections back to the Clubhouse. The stage is characterised by regular ups and downs, but no major signature climbs and all the little ups are followed by some delightful downhill single track rewards. It’s the fun day of the Encounter and it takes place in beautiful surroundings. We finish back at the Elements Clubhouse where a delicious lunch again awaits. The journey back to Sondela is probably the most manageable of all three stages. It’s nice and fast… mostly. Again, we leave Elements on some of the new single track and the event then heads onto a gravel road for a 3.5km descent before entering Highlands Private Estate. Beautiful views and beautiful houses await at Highlands and we’ll be climbing right to the top viewing point on the plateau inside the Estate. We cross over what they refer to as stand no 100, which is right on the edge of the mountain. Then it’s down into Lekkerbreek and past the shooting range next to the dam before turning into Marulani. At Marulani some wonderful hospitality awaits (as was the case in 2017!). Out of the gate at Marulani a delightfully quick and long downhill stretch awaits, albeit technical here and there. We’ll then go into Thaba N’thle. 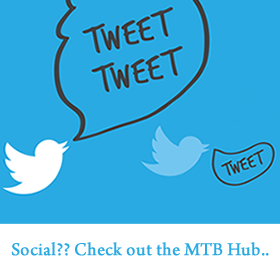 We didn’t ride Thaba N’thle last year so it’s some nice and fresh single track that awaits. 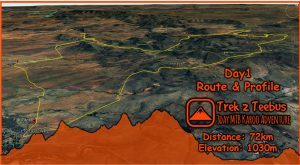 There is a little rocky climb halfway through Thaba N’thle but a smooth tar road awaits as a reward on the other side. The route then links up with Thaba Manzi where some Rhino spotting awaits. The event passes by Tannie Poppie’s shop again, but we’re not taking the same route back to Sondela as used on the first day – it’s only a 1km stretch which we use to access the new stage 3 trail back to Sondela. After crossing the tar road, the route runs next to the historic Buiskop. Some singles and climbing follow Buiskop before we then access the same trail which took the event back to Sondela in 2016. Inside Sondela we’ll enjoy 15km of fast single track before finishing at the Farm Yard.